The Samsung Galaxy S3 launched in London today, and with it some intriguing accessories. The top of the list is the Samsung S Pebble. This tiny device is an MP3 player that pairs up with the Samsung Galaxy S3. There's not many details on the S Pebble, but we did manage to get our hands on it and prise a little bit of information from Samsung. According to the Big S, the S Pebble is a "portable MP3 player that pairs perfectly with the Galaxy S3." It's essentially for fitness freaks who don't want to take their phone out of their pocket when running, doing judo and other strenuous exercises. The S Pebble has a built-in clip, weighs just 13.3g is available in both Pebble Blue and Marble White. The size of the thing is a miniscule 32.5mm x 43.1mm x 13.2mm. 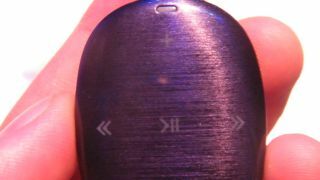 The Samsung S Pebble has been given its own memory as well, so you can add 4GB of content on to the device. Playback of audio is done at 44.1KHz, 128Kbps and the S Pebble can run for a whopping 17 hours without dying on you. It can play MP3, WMA, DGG and FLAC - it also has something called SoundAlive on board, which helps with audio clarity. When it comes to a Samsung S Pebble release date we have no confirmation but it should be in the shops at the same time as the Samsung Galaxy S3, which is May 29 or May 30 if you are in the UK. Pricing is also yet to be announced.